« *** WINNERS *** Lisa, Brenda and Cassie are Living the Life of Riley! CONGRATULATIONS! I LOVE jewelry and seem to have a ton of it! My husband always knows that if he's ever in doubt about what to get me on my birthday, any holiday, etc., he can always rely on jewelry. Unfortunately, when it comes to storing all of this jewelry, I'm at a loss. I used to use the gift boxes my jewelry came in, until I developed a towering mess and ended up wearing the same old pieces simply because I couldn't see what all I had. RedEnvelope has created an elegant solution for displaying your unique Valentine's Day jewelry with the Sculpted Jewelry Tree. Keep reading to find out how this piece of artwork can help you to decoratively organize your baubles. I reviewed the Sculpted Jewelry Treefrom RedEnvelope, which retails for $69.95. I absolutely love the outdoors and admiring what nature has to offer, so I was delighted with the aesthetics of the Sculpted Jewelry Tree from RedEnvelope. This delicately carved tree is comprised of brass with a satin nickel finish. Each branch and leaf of this tree has been carved specifically for the purpose of housing your jewelry collection. The tree is mounted to a solid mango-wood base, which has a depression carved in the middle, perfect for storing your small earrings and lapel pins. 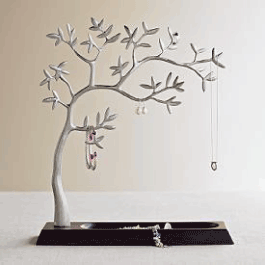 This Sculpted Jewelry Tree measures 12" wide by 14" high, thus giving you plenty of room to store a lot of jewelry. Decorating this tree was half the fun! Finally, I was able to get most of my jewelry out of their boxes and displayed on the Sculpted Jewelry Tree for easy access. Actually, I had forgotten that I had some of what you see in the picture below, just because it was buried in a jewelry box in my closet. Now this jewelry tree reminds me of a Christmas tree because it's all dressed up and looking so pretty. If you are looking for an artfully elegant way for your Valentine to display their jewelry, then I highly recommend the Sculpted Jewelry Tree or any of the other great jewelry boxes from RedEnvelope. If you already have that special piece of jewelry for Valentine's Day, this Sculpted Jewelry Tree would also make a wonderful way to present it to her! 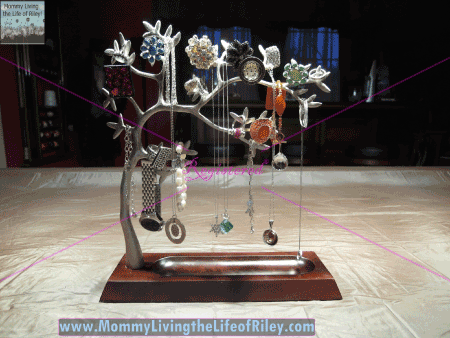 Disclosure: I received the Sculpted Jewelry Organizer Tree from RedEnvelope in order to facilitate my review. No other compensation was received. This product review is based on my own personal experiences with this item and is completely honest and objective.